So ... you get a choice of a shake or a clown, right? I'll take the shake. Clowns are scary ..... not to mention they're not very good blended. I was going to say that sign is all good until you scroll down and see Ronald on it! LOL I share your feelings for clowns. That's funny - great find. 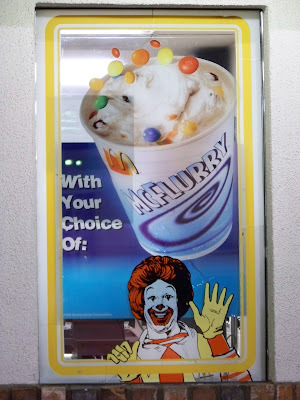 I like clowns, but I would definitely choose the McFlurry. Dang it, now I'm hungry for ice cream.